Fallen has been finished, and once we have some cover art nailed down, it should be published in the first quarter (I'm hoping in time for my excursion to ConDFW in February). Sadly, didn't quite make it this year. Only finished the first draft on this one (now titled Life and Death). Perhaps I can get this expedited in time for my (hopefully I'm going, but still haven't heard from the organizers...) trip to ConQuest in May. 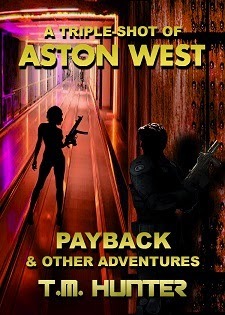 This is one of the goals I actually did finish in its entirety...and if you haven't already picked up a copy, be sure to check out Payback and its companion stories. Lyndon Perry and I have both been neck-deep in other projects for most of this year. Although I've been able to get the next installment, tentatively titled Runaway, started, it hasn't gone anywhere so far.